The following article, “How Do Baby Carrots Come to Be?” was written by Karen Karp and published in Food+City magazine. As you may have suspected, baby carrots are not really babies. 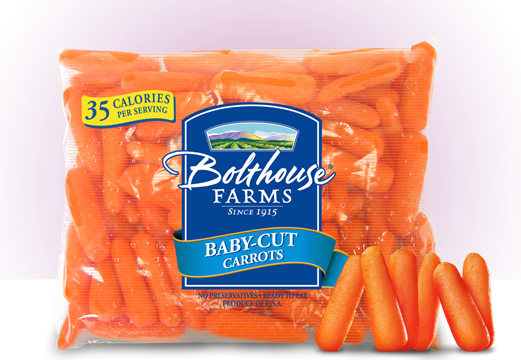 Baby carrots, more accurately called baby-cut carrots (as a true “baby carrot” is simply an immature carrot), are a relatively recent innovation, dating back only to the late 1980s, the brainchild of a farmer named Mike Yurosek. The story I heard was that Mike brought a few bunches of misshapen carrots home as his wife was preparing Thanksgiving dinner, and she took them and turned them into small, consistent, thumb-sized carrot bites for the meal. Ever since then, I liken baby carrot production to woodworking, as carrots go through a similar process – taking something circular and three-dimensional and whittling them down into the mini-carrot shape. Following the seasons, the baby carrots are cultivated in the Imperial Valley, Central Valley and the Salinas Valley, from winter through fall in California. Wherever they originally take root, the carrots journey to Bakersfield, where they arrive at Bolthouse or Grimmway and are immediately packed in an ice water bath. For the duration of their existence before being devoured by you and your kids, they will be kept cool. After being cleaned in a solution of water with a touch of antiseptic chlorine, which is then rinsed off, they go through a sorting process. If they are too thick or too thin, they won’t be wasted – they’ll just wind up as an ingredient in another carrot product, such as Matchstix carrots, juice, smoothies, or cattle feed. Once the raw carrots reach the factory, the entire procedure is overseen by engineers in a Star Trek-like command center perched above the control room, from which they monitor the highly automated process with computers that tell them that the carrots are making their way through the assembly line in the proper fashion, or not. Optical lasers can spot irregularities in shape or any green tops that made it through this far in the process. Once the adult carrots have been morphed into babies, they’re put into their pouches. Depending on the order, they’ll be packed in the one-pound bags you find in supermarket produce aisles, imprinted with brand names like Green Giant or more generic names; or the 2.5 oz. packages served in school cafeterias, as per USDA regulations. Some of the smaller packages that are marketed directly to children bear colorful designs, purposely marketed like junk food, thereby adding to their fun factor and appeal. Once they are packaged and ready for shipping, their temperature is monitored to insure that the cold chain remains at an unbroken 36 to 39 degrees. There’s even a black box in their shipping containers that produces a tickertape with regular temperature readings, so those who receive the carrot shipment can examine the tape upon arrival to be sure the carrots have never gone above or below the proper temperature zone. These Bakersfield products head out in all directions via train or truck to regional shipment centers. The full journey to the East Coast takes about five days. Retail distribution centers are mostly sited outside of cities on interstates where it is more convenient to receive and ship to individual stores. Baby carrots going to schools usually go to terminal markets for produce, like Hunts Point in New York City, where they are purchased by distributors who sell and ship directly to schools, where kids pop them into their mouths at lunchtime.